Consumer Reports recently released a report on the top refrigerators on the market today. This report recommended 21 French-door refrigerators from various manufacturers. Among the recommended refrigerators were seven models from Samsung. That is 1/3 of the models recommended by Consumer Reports coming from Samsung. Samsung has proven to be one of the top manufacturers of refrigerators the world today. 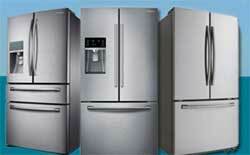 In the Four-door French-door bottom-freezers category, Samsung took the top rating with the Samsung RF34H9960S4. In fact, in the Four-door French-door bottom-freezers category, Samsung Refrigerators held the top 5 refrigerator ratings. And, out of 12 models reviewed from a variety of appliance manufacturers, Samsung had 6 models ranked. In the Three-Door French-Door Refrigerator category, Samsung Refrigerators were also well represented in the appliance review results. This is a more common refrigerator design and Consumer Reports rated over 80 models. Again, Samsung pulled in top honors with the second highest rating for the Samsung RF30HDEDTSR. In the Three-Door French-Door Refrigerator category, 14 Samsung appliances were rated, showing a breadth of available models in the Samsung appliance lineup. Samsung Side-by-Side Refrigerators rated at the top of the review list as well. Of over 50 refrigerator models rated, Samsung refrigerator models held the top 3 rating positions, and had 7 models in the top 20. Samsung appliances fared well in the Oven categories as well. For each segment in which Samsung appliances were rated they held a position in the top 5 overall ratings. The Samsung FTQ307NWGX held the number one position in the 30-inch Induction Smoothtop Range category, while the Samsung NE58F9710WS was ranked number two in the Smoothtop Double Oven category. Consumer Reports recommended only 8 front-load washing machines, three of which are Samsung washing machines. In the overall rating of front-load washing machines, three Samsung washing machines each had the fourth highest rating. Samsung Dryers dominated the ratings with not only the number one and number two spots but seven of the top ten dryers on the Consumer Reports list are Samsung models. When it comes to washer and dryer pairs, Consumer reports recommended 8 sets from various appliance manufacturers. Of the 8, two are Samsung washer and dryers: Samsung WA56H9000AP high-efficiency top-loader and Samsung DV56H9000EP electric dryer; and Samsung WF56H9100AG front-loader and Samsung DV56H9100EG electric dryer. The Good Housekeeping Research Institute evaluated and reviewed refrigerators to find the best French-Door Refrigerators on the market. The result: Samsung Model # RF268ABRS was rated as the Top Performer. Citing the near-perfect temperature management and vast array of features, The Good Housekeeping Research Institute found very little to complain about with this model. The Samsung FE-R300SX took top honors as the best budget buy model electric range and oven. This stove boils water quickly and holds a great simmer. The oven is roomy with electronic controls and programmed settings. The 2014 J.D. Powers Laundry Appliance Satisfaction Study measures satisfaction among consumers who have purchased major laundry appliances: clothes washers and clothes dryers. The results of the customer survey place Samsung at the top of the list for Front-load washers and as the brand with the third highest in customer satisfaction for Top-Load washing machines. Prior to the 2014, Samsung had achieved the number 1 ranking for 5 years in a row. The 2014 washing machine satisfaction score came in at 800 on a 1,000-point scale. Samsung performs especially well in three factors: performance & reliability; styling and appearance; features; ease-of-use; and price. The Samsung dryers ranked second by just one point behind LG dryers. Samsung takes top honors in the refrigerator reviews, a tie with Whirlpool and LG, in the customer satisfaction ranking for French Door Refrigerators. Customer reviews indicated high satisfaction with Samsung French Door refrigerators which were rated with a score of 817 out of 1000. The Samsung French Door Refrigerators stood out from the pack and received special mention for their included features, appearance, and styling. Samsung ranges, ovens & cooktops took the top rank in this kitchen appliance review category. The Samsung line received especially high ratings in the areas of reliability and performance, price, & features. Samsung microwave ovens took the top rank in the Over-the-Range Microwave Oven kitchen appliance review category. The Samsung line received especially high ratings in the customer reviews for their reliability and performance, price, styling, appearance, and features.